Brunch doesn’t have to be boring if you’re following a vegan diet – whip up a batch of these American style vegan pancakes and top with maple syrup and your favourite fruits. When I decided to take part in Veganuary there were two things I was a little apprehensive about: the first was vegan cheese, and the second was not being able to eat eggs. I’m sure I’m not alone in automatically thinking about eggs when I think about breakfast or brunch. Scrambled, fried or poached. In waffles or pancakes. All of my favourite breakfast and brunch recipes seemed to feature eggs in one way or another, regardless of whether they were sweet or savoury. Now don’t get me wrong, there are lots of lovely vegan breakfasts you can enjoy – granola, porridge, fruit, avocado on toast… but if I was going to survive Veganuary and not feel like I was missing out, I knew I was going to have to take one of my all time favourite breakfast recipes and make it vegan friendly. I can never resist a tower of light and fluffy pancakes, dripping in maple syrup and topped with my favourite fruits. So transforming my American pancake recipe into one which was vegan friendly seemed like a pretty good place to start. I’ve always preferred maple syrup to honey and I love oat milk so those swaps were pretty easy. The slightly trickier part was finding a replacement for the egg. There are lots of vegan egg replacements out there but they are all well suited to slightly different things. Flax seeds and chia seeds are some of the more “weird and wonderful” egg replacers that you won’t necessarily already have in your cupboard and so I wanted to steer clear of these. I’m also not a huge fan of the gelatinous texture you get when you mix them with water – even if that is the desired consistency when you’re trying to replace egg! Tofu is another popular egg replacer which is often used for other vegan breakfasts like scrambled eggs or omlettes. But it didn’t strike me as the best egg replacer for light and fluffy pancakes. So, that left me with applesauce or banana as the two fruity egg replacers I could use in this recipe. Both are great – in fact I’ve used apple sauce in the past when baking this almost fat free banana bread (not vegan). The only thing about applesauce is that depending on the brand you use it can be really sweet or really sour. Although banana does give some flavour to these pancakes its not overwhelming meaning you can top them with raspberries, blueberries or add chocolate chips and they will still taste delicious. You’d never guess that these light and fluffy American pancakes are vegan. You don’t miss the eggs or cows milk at all. They are the perfect breakfast pancake for anyone who can’t or doesn’t want to eat dairy and egg. Brunch doesn't have to be boring if you're following a vegan diet - whip up a batch of these vegan banana pancakes and top with maple syrup and your favourite fruits. In a large bowl, mash the bananas with a fork before whisking together with the oil, lemon juice and spices. Add in the flour and beat well until you have a thick paste. Slowly add in the milk whisking well in between each addition. Once the mix is fully combined and smooth, grease your pan with the tsp of sunflower oil. Heat the pan on a medium heat until hot. Ladle the batter onto the pan and swirl to make a circle. Cook for roughly 2 minutes until bubbles begin to appear on the surface of the pancake. Using a spatula, carefully flip the pancake and cook for another 2 minutes. Transfer to a warm plate while using up the rest of the batter. Once you have cooked all of the batter, serve the pancakes warm with your favourite fruits and a drizzle of maple syrup. Add chocolate chips to the batter before cooking for bursts of molten chocolate in each mouthful. For real choco-holics, swap 50g of flour for dairy free cocoa powder and add chocolate chips to the batter before cooking. I think using common fresh ingredients like a banana instead of some of the more unusual – and lets face it, more expensive – egg replacements is a great idea. 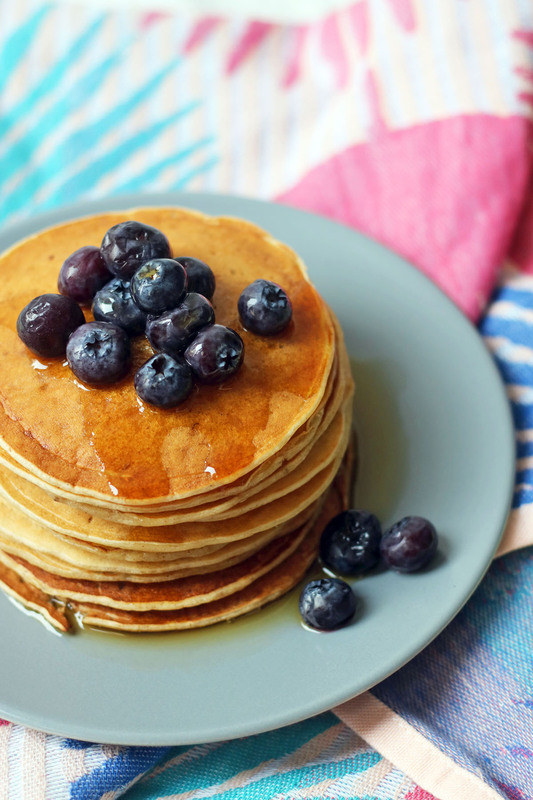 The vegan pancakes look delicious, full of fruity goodness too, a bonus! I love banana in pancakes and bet these taste amazing with the additional spices too! 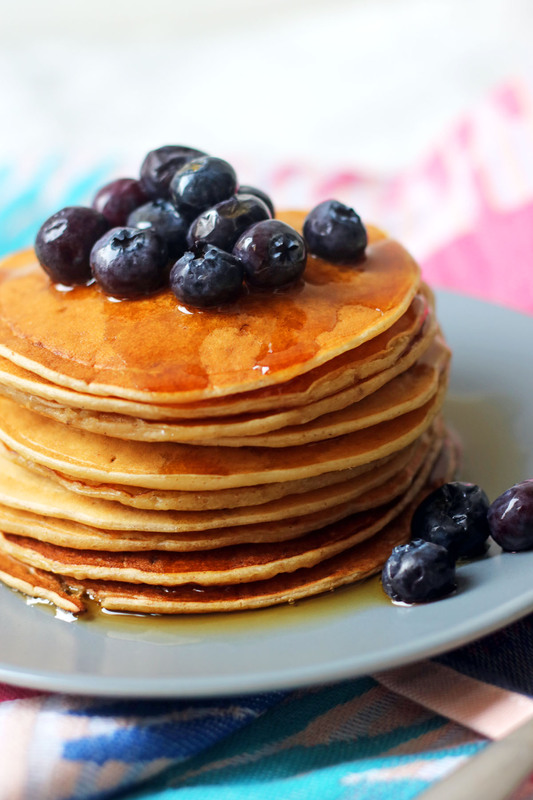 I would love to have a super stack of pancakes like these on a weekend morning with a large pot of coffee!! Bananas make the pancakes moist and soft. And delicious! Thanks!